The warmer, year-round temperatures and lower latitudes of the Carolinian zone foster an unparalleled level of biological richness. At just one per cent of Canada’s landmass, Ontario’s Carolinian forests support an estimated 25 per cent of our country’s species at risk, including Acadian flycatcher and cucumber tree. What is NCC doing to help protect this forest? The Nature Conservancy of Canada (NCC) has invested considerable resources in conserving Carolinian forest in southwestern Ontario. NCC is achieving conservation at a landscape level by building on a network of existing conservation lands. NCC has acquired some of the largest remnant forest blocks remaining in southwestern Ontario and is strategically restoring areas to create larger, better connected habitats and to increase forest interior. 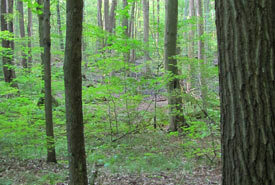 In 2013, NCC conserved the Point Abino Woods property and an addition to NCC’s Backus Woods in Norfolk County, with support from TD Forests.